You cannot escape the inevitability of certain things in life: death, taxes and, if you live in a major city, being caught in a traffic jam. Traffic jams are something you just cannot avoid. 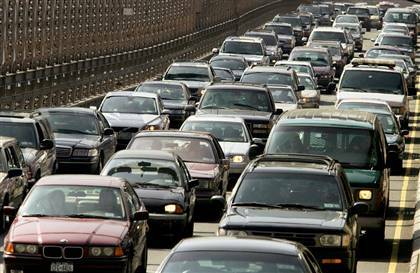 When you think of traffic jams, what images come into your head? Images of hot days and dusty road congested with an endless queue of vehicles glinting against the warm sunlight. So here’s what you can do. You can either rant and rave and sulk the entire time bellowing unprintable words, or you can find some interesting things to do which will not only give you a couple of hours of entertainment, but the surrounding cars in the vicinity as well. Being part of an online traffic school I advise you to choose the ladder. Once you’ve decided on the option here are some interesting tips to follow. Give yourself a complete makeover (if you are a woman). Take your makeup kit and start from the beginning; reapply foundation, eye mascara, liner, lipstick and blush on. Experiment freely, while ignoring the jokes and jibes coming from nearby cars. Make a call to your boss or mum-in-law informing them of your predicament and mention that you will be running late. Flip out your mobile phone and text message as much as you like. There won’t be traffic patrol to pull you over this time around. Receive jokes and hear all the gossip until your battery goes dead. Play all the games your mobile phone has to offer and set up world records that no one can come close to breaking. Become reacquainted with long lost family members and friends. Call up Aunty Jane and ask how Uncle Ernie’s ulcer is doing or listen to Aunty Emilia complain about heart palpitations. This is a good way to regain popularity with family members and learn more about medical diagnosis. Begin a conversation with the old lady sitting in the next vehicle. She may be as bored as you. Get household tips and ask for recipes. You can jot down whatever she may be saying and publish these under your name. This might even make you famous on the primetime cooking channel! Alternatively look out for a bored girl in a nearby car and begin a conversation about makeup, entertainment and soap operas. Get the latest gossip on love affairs, domestic battles and heartbreaks in the television world. Learn about the latest fashion, hairdos, newest hunks and villains, wedding ceremonies and funeral rituals. Clean the glove compartment you have been putting off doing for a while now. Sort out your receipts, lottery tickets, chewing gum packs, tissue packs, various papers and parking tickets. If you have got hunger pangs, order a burger or pizza delivery. Give the location of where you are stuck at. Explain that the highway has become your second home now, at least during rush hours. If you are still bored, improve your mathematical skills by memorizing number plates of vehicle plates in the vicinity, multiply these numbers and total them. Exercise your brain well! Finally, when the traffic starts back up, don’t speed! If you do and get caught chances are a traffic school will help you with your insurance but JUST DON’T DO IT!